The California Golden Bears are back in a bowl game  this year! Specifically, the Bridgepoint Education Holiday Bowl . When: Wednesday, December 28, 5 p.m. PST. Where: Qualcomm Stadium, San Diego and on every faithful Bear’s TV screen. What to watch: The Bears rolling on over the University of Texas Longhorns. What precisely is a “longhorn”? According to our good friend Wiki , it’s “a fatbreed of cattle known for its characteristic horns.” Cows versus Bears? This shouldn’t be a problem. Who to watch: The running backs (RBs). Due to Zach Maynard’s  inconsistent pass performance, the Cal Bears have looked towards the running game to offer penetrating offense in the last few games of the season. 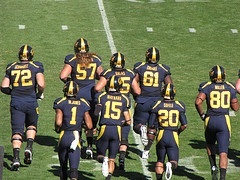 RBs of note include juniors Isi Sofele  and C.J. Anderson . The former has rushed for a total of 1,266 yards for nine touchdowns this season, and in the last four games has averaged 141.3 yards. If Sofele plays at that level, and Maynard plays the way he did in the Big Game, the Longhorns’ defense may have a harder time stopping the ball than expected. Why to watch: Both Cal and Texas were shut out of a bowl game last year — for both teams, this is a redemption game for last season’s mishaps. Expect the Bears and the Longhorns to bring their best. How to watch: Simple enough — ESPN  will be carrying the game. Whether you follow football or not, be sure to tune in at 5 p.m. on Wednesday to cheer on the home team. And there’s no excuse for not having a TV — you can stream the game online through ESPN3 .